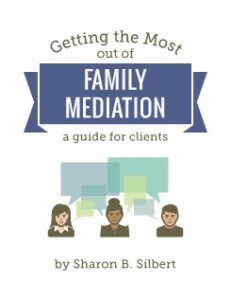 “Getting the Most out of Family Mediation”: A Free Family Mediation Guide for Clients! Going through a separation can be confusing. Many couples assume that their case will ultimately be settled by lawyers or by going to court, but not all cases are resolved this way. More and more, separating couples are opting to participate in mediation, a voluntary process where a dispute resolution professional called a mediator helps participants to negotiate a mutually acceptable agreement. Mediation might be the right choice for you if: you want to maintain control over the process and outcome of your separation, you want to keep your separation amicable, you want to resolve the separation issues quickly, you want the details of the separation to be kept private, and if you are willing to communicate respectfully. The free family mediation guide will help you to understand the process of mediation, see how lawyers fit in, and will help you to compare mediation to other family law options. It answers many of the questions that clients may have about the mediation process. To learn more about family mediation, download your copy of “Getting the Most out of Family Mediation: A Guide for Clients” today!